Ben visited Maranda's family the night before the young girl's brain surgery. He spoke to her parents, outlining the risks one last time. "The surgery should take about five hours. There's a strong likelihood that Maranda could bleed uncontrollably and die right there. Or she could survive and be paralyzed and never speak again. There is no way to know what will happen." As a child growing up in Detroit, Ben Carson had a dream of becoming a physician, a dream that rose out of struggles with poverty, racism, and poor grades. As Ben persevered and strove for academic excellence, his life became one of compassion and service. 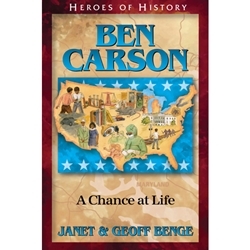 Today, Benjamin Carson, MD, is known as the American neurosurgeon with gifted hands. The first surgeon to successfully separate twins joined at the head, he directed pediatric neurosurgery at Johns Hopkins Hospital for over a quarter of a century. His life continues to be a model of what it means to care deeply, serve brilliantly, and lead courageously (1951-).